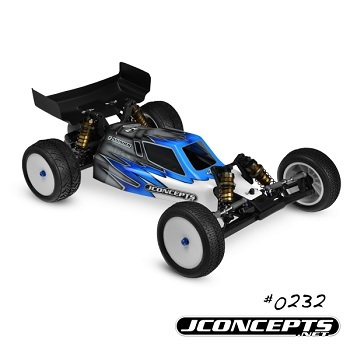 JConcepts hit the ground in Vaasa, Finland with an all new body design specifically for the IFMAR World Championships. Cleverly named, Finnisher, the unique design quickly rose to the top of the field during competition and proved effective on the ground and in the air. Designed with aspects learned from the Punisher line of bodies, the Finnisher provides an even more aggressive look with included details which remain crucial to performance. The Kyosho RB-5 WC Finnisher body is a drop fit for a popular and newly released buggy. Increased windshield angle provides a steady force upfront during mid-flight wind gusts on large jumps. Forward cab placement changes performance / visible bias which helps steering rotation in low traction corners. The side-pods have been simplified and JC chamfered to remove unwanted changes in height to neutralize the at-speed handling. The chassis to body fit has been tightened up where applicable, which helps eliminates large empty voids that contribute to mid-flight directional changes. The rear of the cab has a new step feature and a louver which can be trimmed to allow air to escape at the top of the body through its V-shaped design. In addition to the newly designed body, JConcepts has included 2 of the latest 6.5″ wide Hi-Clearance rear wings which have been specifically designed to fit on the RB-5 buggy.